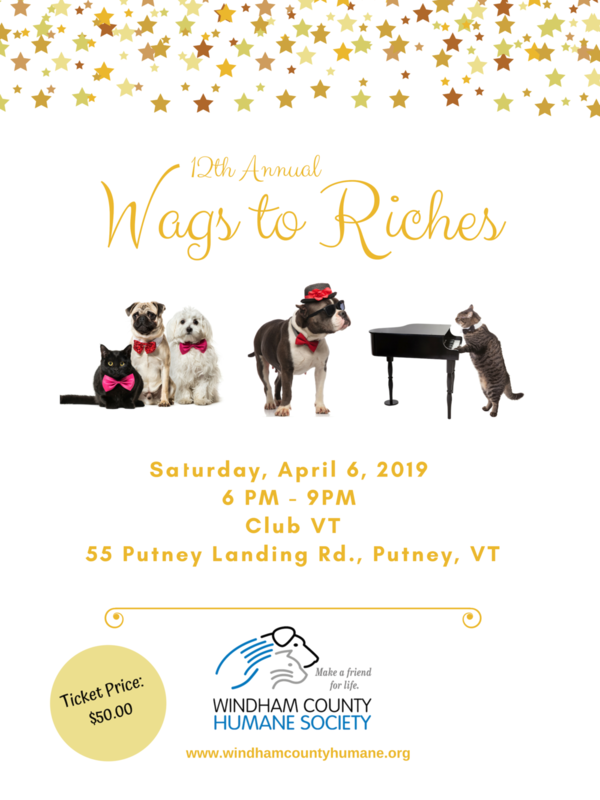 Join us on Saturday, April 6th at Club VT in Putney for a tail-wagging good time at the 12th Annual "Wags to Riches" Party and Auction! Wags will feature fabulous live and silent auctions, live music, cocktails, and delectable hors d’oeuvres and desserts! Doors open at 5:30PM. Proceeds from the event will allow WCHS to help stray, abandoned, neglected and surrendered pets by giving them a second chance at a healthy, happy life. To donate an auction item, please download our AUCTION DONATION FORM. To sponsor the event, please download our SPONSORSHIP COMMITMENT FORM.